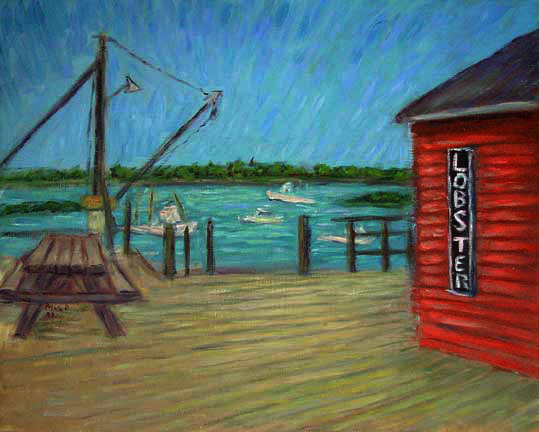 Another painting from 5 Islands, Maine from my 2002 trip. Nothing says Maine to me like lobster and the fishing boats here from the pier. When Ann first came back to Maine with me in 1976 a friend gave me a few lobsters. I chased Ann around the apartment with one and she never ate another lobster in her life, which made me feel terrible. On this trip, though when we went to this place she had some steamed clams with Moxie and she loved them. We returned for some fried clams later and she also loved those, so I got to make up for the lobster a little. I like the red hut here against the black of the sign, along with the simplicity of the entire scene with the winch and the lobster boats. "x 10" matted print on photo paper. Pointillistic/Impressionist Giclee prints of Maine on real canvas or heavy watercolor paper are available. One of a kind Maine embellished prints, which are Giclee prints retouched in genuine oil paint by PaulB. Unless noted PaulB's original Pointillistic/Impressionist oil paintiings are oil on canvas. Paul Berenson's pointillistic/Impressionist oil paintings are in privale collections around the world, including the downtown Los Angeles Athletic Club and have appeared in numerous publications, including the New York Philharmonic Playbill. PaulB.com also builds websites and PaulB is a member of the LA Web Professionals Group.